Welcome to the land of wildfire, hypothermia, desiccation, and rattlers. The stark and inhospitable high-elevation landscape of Nevada’s Great Basin Desert may not be an obvious (or easy) place to settle down, but for self-professed desert rat Michael Branch, it’s home. Of course, living in such an unforgiving landscape gives one many things to rant about. 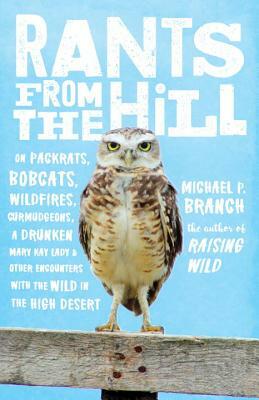 Fortunately for us, Branch—humorist, environmentalist, and author of Raising Wild—is a prodigious ranter. From bees hiving in the walls of his house to owls trying to eat his daughters’ cat—not to mention his eccentric neighbors—adventure, humor, and irreverence abound on Branch’s small slice of the world, which he lovingly calls Ranting Hill. MICHAEL P. BRANCH is a professor of literature and environment at the University of Nevada, Reno, where he teaches creative nonfiction, American literature, environmental studies, and film studies. He has published five books and more than two hundred essays, articles, and reviews. Mike lives with his wife, Eryn, and daughters, Hannah Virginia and Caroline Emerson, in a passive solar home of their own design at 6,000 feet in the remote high desert of northwestern Nevada, in the ecotone where the Great Basin Desert and Sierra Nevada Mountains meet. There he writes, plays blues harmonica, drinks sour mash, curses at baseball on the radio, cuts stove wood, and walks at least 1,200 miles each year in the surrounding hills, canyons, ridges, arroyos, and playas.